Are You Filing an ISF For Your US Bound Cargo? Will you be importing goods via ocean shipping into the United States? Then you will need to file what is commonly referred to as the “10+2” initiative. The Importer Security Filing (ISP) is a regulation enforced by Customs and Border Protection (CBP) that states importers and vessel carriers need to provide electronic data to the CBP for all ocean imports. This is not the same as the CBP bond that is required for all in-bound shipments. It is the responsibility of the importer, whether through a customs broker or directly, to file an ISP for ocean cargo going through the US Customs and Border Protection. This list excludes immediate exportation (IE) and transportation and exportation (T&E). 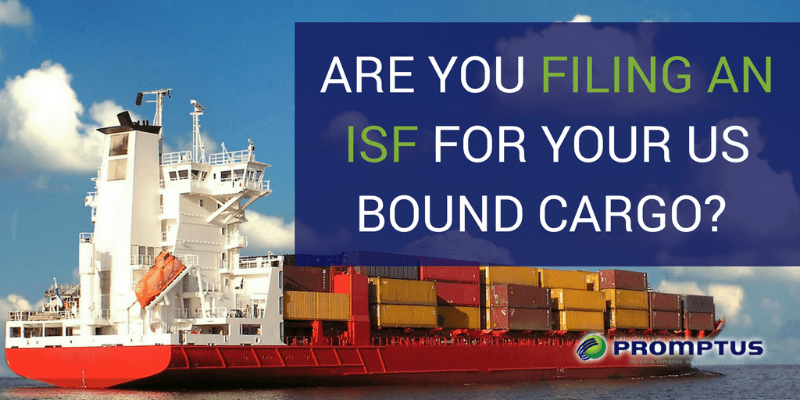 You must submit your ISF files at least 24 hours prior to the cargo being loaded onto the ship’s vessel, or you risk incurring hefty fees or a denial of your ISF. Your manufacturer or supplier. This is the entity or entities that produce(s) your goods either in parts or as a finished product. Alternatively, you can provide the name and address of the supplier/producer/manufacturer to create or locate the manufacturer identification (MID). The physical recipient of the goods. Container where the goods were stuffed and from where they will be shipped. The consolidator who coordinated the packaging of the goods. Importer of record number/FTZ applicant identification number. If you are going to ship goods to an FTZ, you will need to provide the IRS number, SSN, EIN, or CBP assigned number of the party filing the documentation with CBP. The importer of record number for Importer Security Filing purposes is the same as importer number on CBP Form 3461. Consignee number(s). The CBP assigned number, EIN, IRS number, and SSN of the parties on whose account the merchandise is shipped will be required to file your ISF. Country of origin. The country of where the goods being imported were manufactured or produced. Commodity HTSUS number. You will need to provide the duty/statistical reporting number for the Harmonized Tariff Schedule of the United States (HTSUS). The HTSUS number is required to between six-digits and ten-digits. If it is between ten digits, this number can only be used for entry purposes. Along with the 10 ISF filing requirements, you will also need the lowest level bill of lading number given by the freight forwarder is necessary to attribute the ISF to the manifest data and entry of your goods being imported. Promptus LLC has been dedicated to helping assisting clients with ocean shipping and consolidation cargo. We are a licensed Container Freight Station (CFS) available to help importers worldwide with expert global logistics services. ISF enforcement can go a long way in preventing delays and extra costs for your shipments. Maintaining the record of original filing could also be helpful if you are at fault for your ISF being deleted or lost.